We are thankful for the great Finnish summer and autumn we have had, with many lazy nights spent swatting mosquitoes. 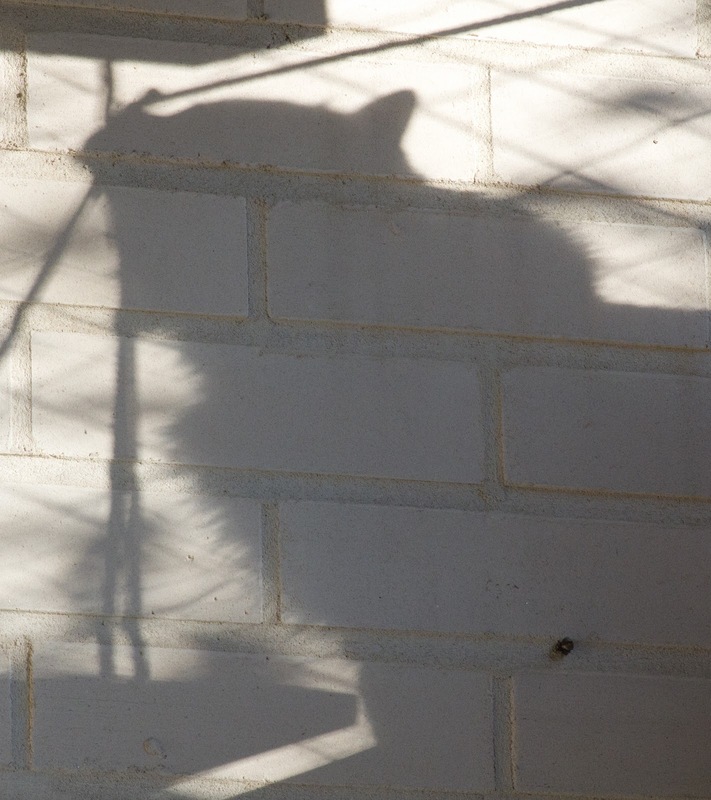 This is a picture of my mighty fluff shadow as I was worshipping the sun from the vast heights of the catio shelves just a few days ago. It is now time for Äiti to get her act together and clear the catio ready for winter, and we shall not be seeing much of the sun for the next five months or so. We shall cope however as we have sisu, and when the snow comes it will be fun to play in it. We are looking forward to the first ninja & snow experience! However when it gets to -30'C we're staying inside! Äiti's note: after yesterday's comments about Stran's libido, I think it best to point out that he was discovered on top of Jura last night. Stran lives life to the full, and he doesn't mind who he 'plays' with. In fact he and Harris have had a special friendship for many years. Jaava must be an interesting diversion for him, and she's booked in for her op next week! Jura will be allowed to keep his jewels for a while but then will join the rest of the castrati. You Finnish cats are a hardy stock - I would freeze my skinny behind in the kind of weather you have to endure! Have a purrfect day guys !!! You know, if there are are little Stran kitties anywhere, they are fine kitties indeed. He does knows beauty when he sees it. Good thing he's had his surgery, though. If Jaava doesn't lose his jewels soon, the -30C will save him a visit to the vet!